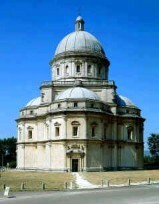 The temple of Santa Maria della Consolazione is located at the edges of the hills of Todi. The church was built between 1508 before Christ and 1607 after Christ on the place of some miraculous recoveries that took place under a niche where were painted the images of the Virgin with child and Saint Catherine of Alessandria. The tradition says that a worker not seeing from one eye, maybe called Iole di Cecco, executing the order given by the commune to free from the brambles the area around the doors of Santa Maria and San Giorgio, would have cleaned from dust the painted face of the Virgin Maria with his own handkerchief. After this, drying his face and his eyes with the same handkerchief, he would miraculously have got the sight back. >> Do you want to visit Todi? Check it out now of the best farmhouses in its vicinity. There are offers for hotels in the area of Todi! Click and Consult them immediately. The temple of the consolation is one of the best examples of Renaissance art existing in Umbria. The project of the Greek cross plan, characterized by five cupolas, a central one and one for each apse of the plan of the temple, should be the work of the school of Bramante, although some people says it is the fruit of the work of Cola di Caprarola and others, Antonio da Sangallo il Giovane. Anyway it seems clear that the direction of the works had been given to this last one, who achieved the temple with the forms of great harmony more or less 70 meters high at the top of the lantern above the central cupola. The inside of the Temple of Santa Maria of the Consolation, characterized by the arioso character and the lightness of the spaces typical of the Renaissance, hosts the statue of Pope Martino di Todi, the ones of the twelve apostles and in the northern apse close to the baroque altar an image of the Virgin with the child that is said to be miraculous too. The devotion of the inhabitants of Todi for the Virgin and for the temple that the city dedicated to her is so that to put an end to what was called from various places a real architectonic example, which is the building of a sacristy in 1613 leaning on the north side of the temple, all the city protested obtaining at the end its demolition in 1862 after Christ.